You can’t tell anyone. It is a secret. The ABC has a coup on their hands. Leigh Sales scored an interview with Donald Trump. It is to be broadcast soon but don’t tell anyone. 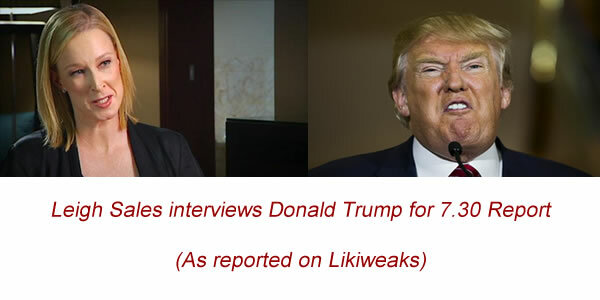 www.mycomment.com.au has obtained an exclusive copy of the interview. You might have heard of Wickileaks. We have our own source. LickeWeaks. Here is the transcript. Donald Trump: Yes. They woke to Donald Trump. You’re a nice piece of skirt. Better than you boss Angela Merkel. She looks like a Mexican grandma. Leigh Sales: Think you have your geography confused. We are the country with jumping kangaroos and revolving PMs. Speaking of Mexico, do you still plan to build the wall? Donald Trump: Sure do. The guy who built a wall at my country estate is preparing a tender as we speak. Only works for cash so this should be a nice money earner. Employs Mexicans at $2 per hour so language will not be an issue. We will make America great again. More bricks, more concrete. The wall will be like a thousand Trump Towers on their side. We even have a way of commercializing it. Leigh Sales: How is that? Donald Trump: Well you know in Game of Thrones where they had a castle on the wall? We plan to build castles along the wall. My dear friend James Packer is going to build 1,000 casinos. One in each castle. We will bring in those high rollers from China to do a “wall crawl”. Loose money at every casino from the Pacific to the Gulf of Mexico. Leigh Sales: Moving back to your relationship with the Republican party, there are some bridges to build. Donald Trump: Certainly are. The sooner they start building bridges the better. They have a lot of work to do to get me onside. They either do it my way or they’re fired. The Republican party needs to change. Leigh Sales: Can you give me some examples of how they have to change? Donald Trump: The name for a start. GOP is so old school. Grand Old Party. GOP should be “Grab our Pussies”. Leigh Sales: But what about the Democrats? You promised to be inclusive. Donald Trump: Got that covered too. Gonna change economics. GDP will be changed to “Grab Democratic Pussies”. So Leigh, which side of the fence do you straddle? Are you GOP or GDP? Leigh Sales: I am more a barbed wire fence. Razor wire to be exact. Donald Trump: Ouch! Are all you Sound of Music types so feisty? Leigh Sales: Think that was Switzerland. I am from the Australian ABC. You probably know us best for Bananas in Pajamas. You haven’t met my colleague Sarah Ferguson yet have you? She could start off asking a few questions about your choice in ties and in 15 minutes have your famous thumb and forefinger action made permanent. Left thumb permanently attached to right forefinger and right thumb to left forefinger. Donald Trump: Is she hot? Leigh Sales: Hotter than any of your daughters. A veritable blowtorch in the interview seat. Donald Trump: Does she do beauty pageants? Leigh Sales: She would do you in 2 minutes and there is an element of beauty in that. Back to more mundane matters. What is the America you want to take the US back to? When was America great? Donald Trump: I want to go back 200 years. Bring back slavery. There were the rich, and there were the rest. Slaves had a bed and a meal or two each day. There are people out there who are worse off than slaves. I want to bring them back to the golden age before the War of Independence. Slavery isn’t all bad. It removes the stress of making choices. Do I eat today or buy a pair of shoes? Slavery will provide a meal and no shoes. Easy. No worrying about making the right choice. Leigh Sales: I suppose you would build a wall to keep the slaves in. Donald Trump: Not only that. I intend to build a wall around all those states that voted Democrat. Want to keep them out of the real America. Leigh Sales: How will you bring back corporations that have moved overseas? Donald Trump: Tell em they have three months to move back from South Korea or Chile or Canada or wherever. If not, we will nuke em. Solves two problems. Firstly it gets the companies back or eliminates them so US companies can take over, and secondly it gets rid of old nukes. Spoke to a general the other day and when I told him he was literally dribbling with excitement. Just wanted to push that button. Said he had not been so excited since he first heard about Agent Orange. You know we used to make light bulbs in America. Now all the light globes are made overseas. Globalization is not good for America. We need to reclaim the light. At this stage a presidential aide came on and gave Donald some tablets and a glass of water. He seemed to settle down. Leigh Sales: What action will you take against China? You have been talking up your opposition to them all through the election. Donald Trump: For a start we are closing every Chinese restaurant in America. We have a plan to build more islands just off the coast of the South China Sea islands they built. With the cooperation of some entrepreneurs from Las Vegas we will put a casino on each island. See where is the most popular with Chinese tourists. Maybe put up a whale meat restaurant and get a few Japanese to come over. Leigh Sales: And what about arms control? Donald Trump: The NRA came up with a great plan that I will announce soon. We are not going to sell guns to anyone. We will lease them. Brilliant. You can be a terrorist group or revolutionary or even an elected government like Syria and rent as many guns as you want. Things quieten down we take them back and you cancel the lease. Might even try rent-a-nuke. Vlad the Lad talked to me recently about renting a battalion of marines to invade somewhere. Didn’t want to endanger Russian soldiers. I said our allies should pay for our military support but why stop at allies? We can rent our military forces to anyone. If Sudan wants an aircraft carrier, we can come to some arrangement. Leigh Sales: Are you a friend of Israel? 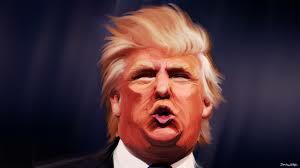 Donald Trump: Never met the boy but I believe he is the best fullback in Rugby. I would go and watch Rugby but it is un-american. Should build a wall around all Rugby fields. Leigh Sales: I was talking about the country, not Israel Folau. Donald Trump: That’s one of them pesky “I” countries. Iran, Iraq, Israel, Iceland. Gonna nuke them all and build a wall around them. Leigh Sales: Now the election is over, and all the accusations of sexual intimidation are fading away, will you soften your approach to women? Donald Trump: I am not softening anything for women. Nobody feels more about women than I do. Do you know that one of my first presidential decrees will be to leave the toilet seat up in the White House? I live with a tribe of the female gender so completely understand women. How can I help it if they find me irresistible. Only yesterday someone asked me if I could tell them who did my hair. Obviously appreciates style and quality. Leigh, you should see my hairdresser. She could do something in a fluro orange for you. And that pale skin! You need skin that matches your hair. Get some style Sales!! Leigh Sales: Well thank you Mr Trump for your time. I truly believe you will make America grate again.